Elections division to absentee voters: No do-overs. Plus, new endorsements in Alaska governor’s race. Alaska's campaign for governor shifted into a new phase Monday after Gov. Bill Walker's surprise announcement that he was dropping out of the running with just two-and-a-half weeks to Election Day. 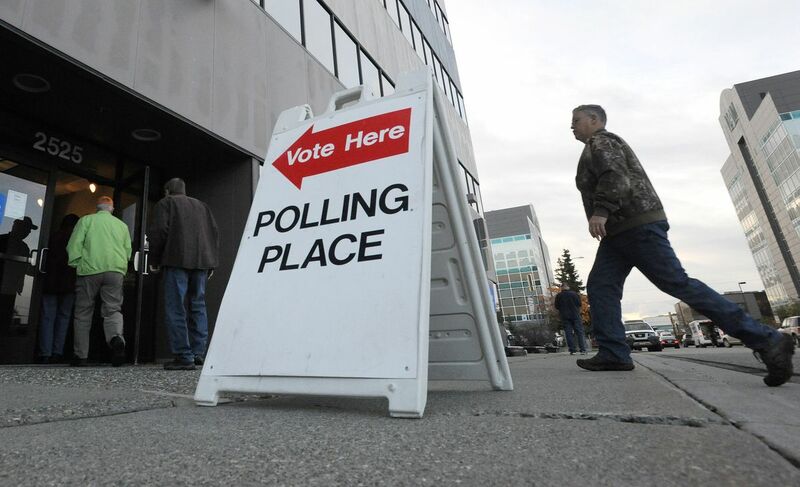 Some Alaskans headed to polling places on Monday for the start of early voting. Organizations and Alaska's congressional delegation were throwing support to the two major candidates left: Republican Mike Dunleavy and Democrat Mark Begich. Begich and Dunleavy were campaigning hundreds of miles apart — Begich in Kodiak and Dunleavy in Utqiagvik, formerly Barrow. Any Alaskans who sent in their voted absentee ballots before Walker suspended his re-election campaign on Friday do not get to vote again, the elections division said. Walker and former Lt. Gov. Byron Mallott both dropped their bids for re-election last week, too late to have their names removed from this year's general election ballots. As of Friday, the Alaska Division of Elections had sent out 23,773 absentee ballots, and Alaskans had voted and returned 3,076 of them. "Unfortunately, there is nothing in Alaska law that allows the division to replace a ballot once it has been voted and returned to the division," Samantha Miller, division spokeswoman, said in an email. Whether Alaskans decide to vote early, absentee, or on the Nov. 6 Election Day, they will still see four candidates for governor: Begich, Dunleavy, Libertarian Billy Toien, and Walker, an independent. "A vote for any candidate for governor or lieutenant governor appearing on the 2018 general election ballot will be counted as a vote for that candidate," the elections division said in a brief statement posted on its website Monday. The elections division said no candidates for Alaska governor or lieutenant governor withdrew by the deadline, Sept. 4. Under state law, candidates must withdraw at least 64 days before the election. Any Alaskans who have filled out their absentee ballots, but have not yet returned them to the elections division can get a replacement ballot if needed by contacting the division's Absentee and Petition Office, Miller said. With Walker's name still on the ballot, what happens if he wins? "We just don't see that happening," Walker campaign manager John-Henry Heckendorn said. Walker and Mallott remained locked in a tough race for re-election up until last week. Mallott, a Democrat, abruptly resigned from office and from the re-election campaign on Oct. 16 over unspecified "inappropriate comments" he made to a woman. Three days later, on Friday, Walker announced in an emotional speech at the Alaska Federation of Natives annual convention that he was suspending his re-election campaign and throwing his support to Begich. He told the crowd that Begich had the better odds of defeating Dunleavy in the general election. What was for months a three-way race that left some voters conflicted between Walker and Begich is now a two-way battle. New endorsements started lining up behind each candidate on Monday. 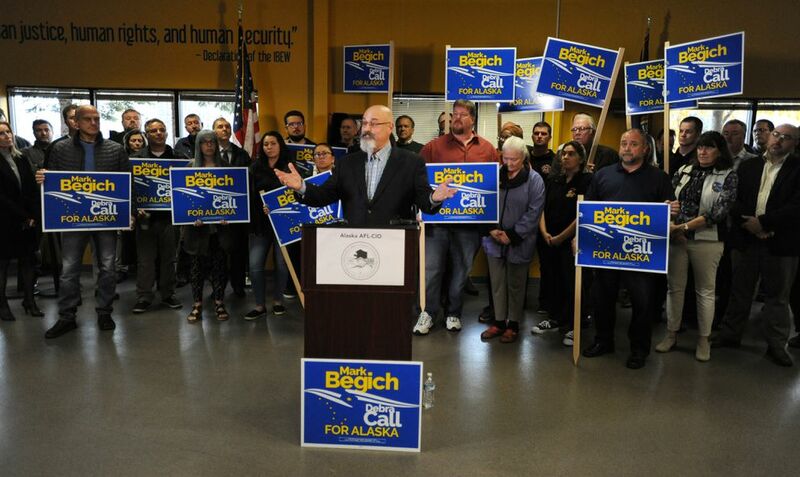 The Alaska AFL-CIO endorsed Begich. The group, which is the largest labor organization in the state, had previously endorsed Walker. In a news conference Monday, Alaska AFL-CIO president Vince Beltrami said the choice between Begich and Dunleavy "was not a difficult decision." Alaska's congressional delegation is supporting Dunleavy. U.S. Rep. Don Young and Sen. Dan Sullivan, both Republicans, endorsed Dunleavy on Monday, the Dunleavy campaign said in an emailed statement. Young is up for re-election this year, facing challenger Alyse Galvin, an independent. Republican U.S. Sen. Lisa Murkowski will also be endorsing Dunleavy, said Michael Pawlowski. He's Murkowski's chief of staff but spoke about the endorsement Monday evening in his role as a spokesman for her campaign. Pawlowski said Murkowski was working with the Dunleavy campaign to put out her own statement of support. It remains unclear what's next for Unite Alaska, the independent expenditure group that formed in support of the re-election of Walker and Mallott. The group raised more than $1 million. Tim Woolston, Unite Alaska spokesman, said in an email Monday that he didn't yet have information about how the group will move forward, including what happens to the unspent money. He said he expected to have more details Tuesday. As for the Walker campaign, it has stopped accepting donations and is working to take down Walker-Mallott campaign signs and other advertisements, Heckendorn said Monday. It's "very possible" the Republican Governors Association will spend more money in Alaska's governor race, said Jon Thompson, RGA communications director. The RGA, based in Washington, D.C., is a national organization dedicated to electing and supporting Republican governors. It has already given $2.71 million to Families for Alaska's Future — Dunleavy, an independent expenditure group supporting the Republican candidate, according to filings with the Alaska Public Offices Commission. It has also contributed $75,000 worth of survey and polling results to Dunleavy for Alaska, another independent expenditure group supporting Dunleavy's candidacy. "We see Alaska as a top pick-up opportunity," Thompson said. "We're committed to winning the governorship." Independent expenditure groups can raise unlimited funds from individuals and groups, but they can't coordinate with the campaigns they're supporting or opposing. The Washington, D.C.-based Democratic Governors Association has yet to spend money in the Alaska governor's race, confirmed Jared Leopold, communications director for the DGA, on Monday. The DGA is a national organization dedicated to electing Democratic governors. Walker dropping his bid for re-election "certainly increases Democratic chances there," Leopold said. He said the organization was "keeping a close eye on the race." Asked whether DGA expected to spend money in the governor's race, he said, "the dynamics have changed a lot and we're assessing." The independent expenditure group that formed in support of Begich, Begich for Alaska, reported raising about $172,000 in contributions in a state filing on Oct. 16. The largest contributions are $50,000 from Planned Parenthood Votes Northwest and Hawaii and $100,000 from W. Dean Weidner of Kirkland, Washington. Weidner is chief executive of Weidner Apartment Homes.